Fishing by large is a very safe activity. But make no mistake accident will often can occur. Most fishing accident result by hooking something else than a fish, like your earlobe or someone’s nostrils. Fishing hooks are designed with a barb to hold fish unfortunately the barbed hook can be very difficult to remove from a human and always leaves a pretty nasty scare, besides it’s very painful too. With a little care and preparation hooking accidents can be eliminated. Here are few basic common sense tips that will help to avoid hooking accidents. Always handle fishing tackle responsibly. Make sure to look behind you before casting so that your hook will not catch a power line, tree, or another person. Don't leave your tackle lying on the ground. Someone may trip and fall on it, step on a hook, or even break your tackle. If a hook is deep inside of a fish's mouth, don't put your hand inside. Instead, use some kind of a hook remover to carefully remove the hook. 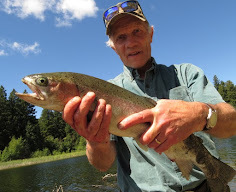 If this doesn't work, cut the line as far back as you safely can to release the fish. Always remove hooks and lures from your line and store them in your tackle box when moving your equipment. Never cast your line toward people. Should you snag up under water don’t pull on the line in an effort to get unhooked. The hook could come lose and from the tension on the line fly with considerable speed toward you. Do not discard of hooks by throwing then into the water or on the shore. A person walking barefoot or a dog could get injured. 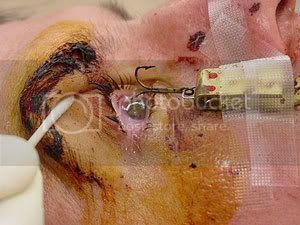 This photo is of a fisher that ended up with a treble hook embedded in his eye. The unfortunate man made the mistake by standing behind his fellow fisherman as he cast his line. The caster made the mistake of not looking behind him to check if the immediate area behind him was clear. The hook emended itself so deeply in the eye that the man lost his eyesight. Thanks for the timely reminder on what a little lack of concentration can cause the angler. If you don't mind, I think I will add a post on my blog that refers back to this list so that my readers can be reminded. Thanks for your visit and comment Eagle Eyes. Go right ahead and add a post on your blog. You’re right ever so often we need to be reminded what can and often will happen if we let our guard down.